Buscot Park Frescoes - Faringdon Community Website. by Roger Vlitos – Assistant Curator to the Faringdon Collection, Buscot Park. 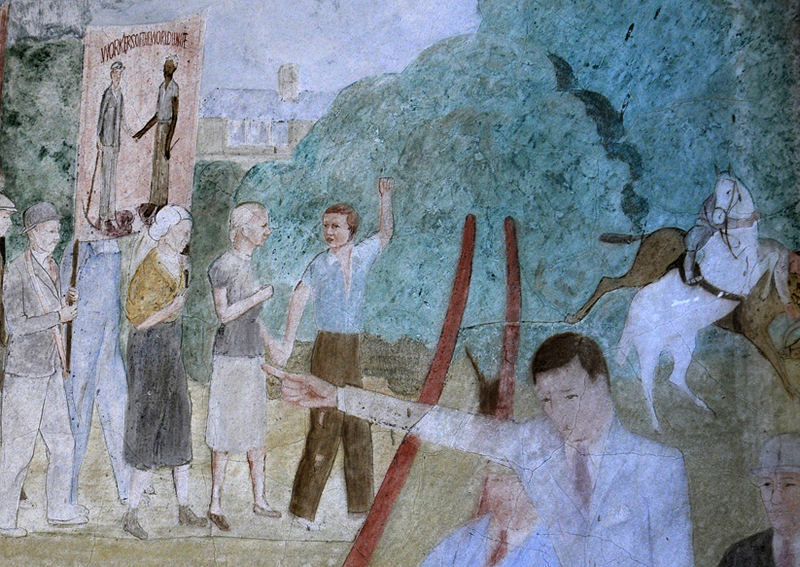 Frescos commissioned for the exterior of Buscot Park’s little theatre between 1936-7 were painted by Francis John Clarence Westenra Plantagenet Hastings, 16th Earl of Huntingdon, known as Viscount Hastings until 1939. Friends called him “Jack”. The images contain some subtle in-jokes, possibly inspired by the presence of Lord Berners, who appears twice here. Four roundels show portraits of the artist Viscount Hastings, Lord Berners, Susan Lawrence M.P. (the first woman on the Labour Party committee) and Frank W. Bourne, Lord Faringdon’s secretary who he nominated as Labour candidate for Abingdon – a seat Gavin’s family had previously held for the Conservatives for generations. Actions like this led to him being dubbed "The Red Peer" by some sections of the press. 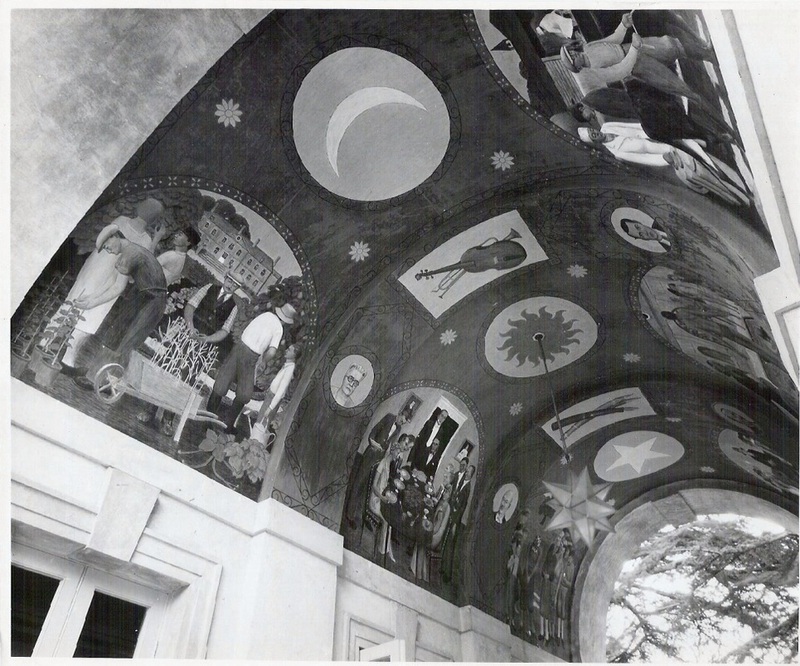 The frescoes have faded but originally looked like a Mexican chapel, with a blazing sun, crescent moon, musical instruments and writing tools on the vault above. Scenes painted on the walls below were framed in a folk-art style decorative pattern with stars and fretwork so that the whole might have resembled a reredos showing saints in a chapel, in spite of the fact that Lord Fraingdon was an atheist. Lord Berners' genial personality and wit had an inspirational effect on creative people. In 1926 he had met the young Rex Whistler who was studying painting in Rome. He introduced Rex to the finest things Italy had to offer - food and wine as well as scenery, Art and architecture. Whilst he was homosexual, Rex reported that there was no hint of his being other than a gennerous and highly civilized mentor. 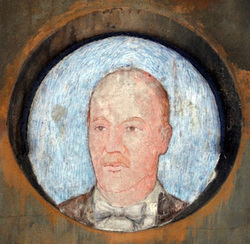 Whistler was later to paint some affectionate and amusing portraits of him at Port Lympne, the home of the politician and art collector Sir Philip Sassoon. Gavin Henderson (the 2nd Lord Faringdon from 1934-77) was their neighbour at Buscot Park four miles away. Both peers were aesthetes with friends in common, but Gavin’s were often more political. Francis John Clarence Westenra Plantagenet Hastings, 16th Earl of Huntingdon (Viscount Hastings until 1939) was a friend of Gavin’s from Eton, where (naturally enough in the topsy turvy world of "the Roaring 20's") he had become a Communist and Gavin a Socialist. Viscount Hastings' friends called him “Jack” and he had worked as an assistant to the Mexican Communist muralist Diego Rivera before painting these frescoes. 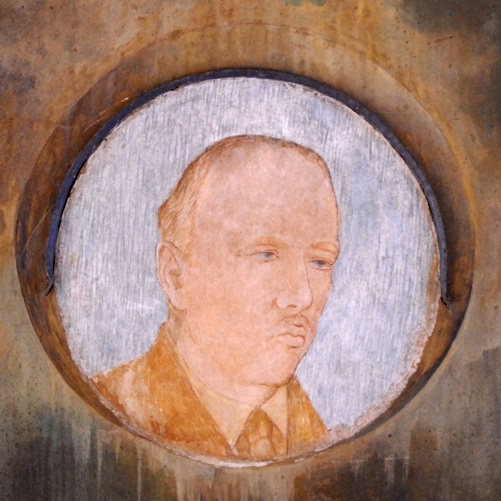 Berners was apolitical but a portrait of him occupies one of the roundels. Here he looks like a local hero for the other social revolutionaries around him, such as Frank.W.Bourne, the first Labour Party candidate for Abingdon ( who failed to get elected). John Betjeman, one of Lord Berners' close friends and neighbors, wrote a jocular Christmas card to Lord Faringdon afterwards referring to “Betty Berners” and quipping “Christ is Bourne”. Lord Faringdon is shown addressing a rally of the Faringdon Labour Party beside a banner reading ‘Workers of the World Unite’. Behind the noble Lord two mounted policemen are having difficulty staying in their saddles as his fiery oratory has frightened the horses. Nearby a youth has been inspired to raise a clenched fist in the Internationalist salute, a reference to Lord Faringdon's haven for boy refugees from the Spanish Civil War at Buscot Park. For Gavin’s friends these frescoes were probably a caprice, as they expected an end to the class sytem and social priveldge. So the frecoes contain some in-jokes at his expense, which he apparently enjoyed as much as his friends did. 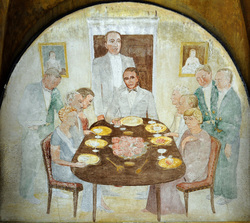 The central image consists of a luncheon party where Lord Faringdon’s guests are attended by his butler Mr Buck and three footmen in green livery around a table set with Lord Faringdon’s grandparent’s gold plates. The footman on the left we know was Mr L.A. Little, as he wrote some decades ago to give pass on details from memory of his former life at Buscot Park. He said that Lord Berners was seated on the left between Viscount Hastings’ wife Cristina and his sister Lady Marion Cameron. Berners is eyeing the Liberal and Fabian leader (and first female governor of the BBC) Lady Violet Bonham-Carter. She sits on the lower right with her hand raised to her throat in a gesture of surprise. The tale is that she was mistakenly thought to be a vegetarian and served with only an apple with its leaf attached on her gilt plate. Their host’s economy with alcohol is also hinted at as the glasses are empty and there are no bottles for the servants to replenish them. Robert Heber-Percy was quoted as saying “We did our drinking before and after going to Buscot Park”. Perhaps this is why he did not appear with Lord Berners and the other guests. Those wishing to see the frescoes at Buscot Park can do so by visiting on one of the many open days between April and September. They offer a glimpse of a topsy-turvy age when Peers became Socialists and Socialists became Peers. They also preserve something of the life-enhancing humour, which was Lord Berners’ great gift to his friends. Buscot Park, of course, survived its Socialist peer precisely because he took steps to ensure that the public would enjoy the Faringdon's Art collection, Palladian house and pleasure gardens in the future. His nephew Lord Charles has honored that wish by completing projects his uncle began, as well as adding his own.